Conservative media figures are touting a far-right coalition's sensationalist claim that the U.S. military is rife with anti-Christian hostility, ignoring the lack of evidence to substantiate the charge and allowing anti-LGBT hate groups to drive coverage of the issue. Restore Military Religious Freedom (RMRF) - a coalition of right-wing organizations including Liberty Counsel, the Heritage Foundation, and Southern Poverty Law Center (SPLC)-designated hate groups the Family Research Council (FRC) and American Family Association (AFA) - is leading the charge with this bogus claim. In early November, RMRF released a video featuring interviews with current service members making sweeping statements about the alleged anti-Christian bias permeating the armed forces. The video listed a few examples of apparent attacks on religious liberty in the military, but those examples don't withstand scrutiny. Hinting at the real motives behind the RMRF's effort, the video includes a soldier complaining about the new wave of "tolerance" sweeping the military - a not-so-thinly-veiled reference to the repeal of the Don't Ask Don't Tell (DADT) policy. For years, the organizations behind RMRF have crusaded against open service by gay and lesbian soldiers, often using vitriolic language. Depicting the armed forces as anti-Christian has been central to the right's attack on the post-DADT military. Anti-LGBT hate groups decided long ago that their ultimate solution must be the end of open service, but it was a solution in search of a problem. In its Christian persecution narrative, social conservatives have managed to manufacture that problem, despite that it consists of made-up anti-LGBT horror stories. Right-wing media are happy to take the hate groups' bait. There were seven chaplains enrolled in the San Diego program led by Nancy Dietsch, a Department of Veterans Affairs employee with a history of antagonistic behavior toward evangelicals, Wells said. 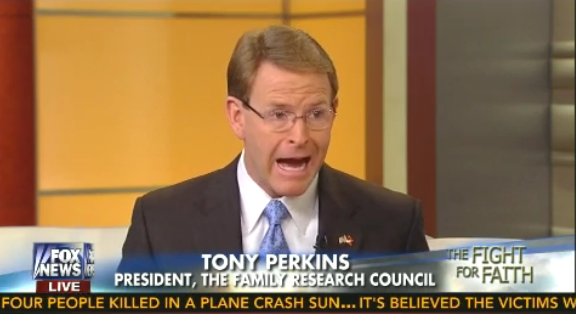 "She's been very, very critical of Christians," Wells said in a telephone interview. "Instead of teaching anything dealing with faith issues, she's dealing with a holistic, humanistic approach. It's the idea that the spirit comes from within." The VA did not return telephone calls, but they did release a statement to NBC San Diego. The VA said the two men were "bullying other classmates and refusing to honor other faith groups." Wells said the chaplains were subjected to anti-Christian bigotry. "And that would be putting it mildly," he said. "A lot of these so-called liberals are very liberal with their own ideas, but when it comes to somebody else's ideas, they don't want to hear it. The allegations against Dietsch hardly prove systematic discrimination against military Christians, and if past charges of VA bias against Christians are any guide, it's perfectly plausible that the suit is just another ginned-up controversy that distorts Dietsch's actual actions. The RMRF video, for instance, pretended that the VA had "banned" Christian prayer at military funerals in 2011, when in reality, a department official had merely instructed employees to make sure that services reflected "the religious preferences, if any" of veterans' families. In anti-LGBT activists' fantasy world, an inclusive military has moved the country another step closer to re-education camps and purges, with Christian soldiers being kicked out of the military and replaced with gay ones. Instead of calling out these paranoid delusions for the ridiculous horror stories they are, Fox News would rather treat them as legitimate fears worthy of serious, uncritical attention.